Lyle: In the last lessons you've learned how to tune your guitar, now you need to learn how to hold the guitar and the pick, where to put your fingers, and how to read guitar tablature (TAB). Lyle: Let's quickly go over how to hold your guitar. If you're sitting down with the guitar, you shouldn't need a strap. Simply balance the guitar on your leg. Your shoulders and knees should be straight out, square ahead of you and the guitar neck pointing away from you. Lyle: The left-hand positioning is important. Put the tip of your thumb opposite the joints of your second and third fingers. Keep your elbow in and your fingers curved. 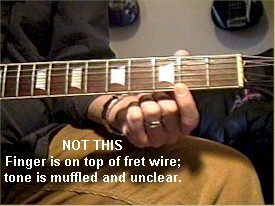 Lyle: When you place a left-hand finger on a string, make sure you press firmly and close to the fret wire as you can without actually being right on it. This will help you produce a clean, bright tone. Lyle: Any questions before we move on? Francric: What if your fingers can't stretch all the way? Lyle: You should examine your wrist grip. 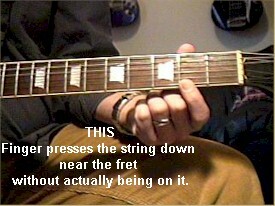 You should be able to reach all four frets with one finger on each fret. Relax and "drop" your wrist down so that your fingers curl back up over the fretboard. 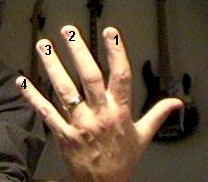 Examine the video demonstration called "four finger stretch". Get them close enough so that you can produce a good sound when you pick each of the notes. Lyle: This is a very important issue for many beginners, getting their fingers to stretch. If you have a good left-hand position, it will be easier to reach the long stretches. Lyle: A good exercise is the four finger stretch on all strings. In later lessons I'll teach you a whole bunch of good finger exercises for stretching, dexterity, and speed. Lyle: Let's move on to the subject How To Read TAB! Lyle: TAB - TABLATURE graphically represents the guitar fingerboard. Each horizontal line represents a string, and each number represents a fret. Lyle: Now I'll take you through many of the different notation symbols. Lyle: HALF-STEP BEND: Strike the note and bend up 1/2 step. Lyle: WHOLE-STEP BEND: Strike the note and bend up one step. Lyle: A half-step = one fret, a whole-step = 2 frets. Lyle: ONE AND A HALF-STEP BEND: Strike the note and bend up 1 1/2 steps. Lyle: Acoustic guitars have heavy gauge strings and are very hard to bend, don't worry about it. Francric: You are pushing with all three fingers? Lyle: Yes, when you bend a note, grab the string with three fingers and you'll have more strength and control of the bend. Lyle: SLIGHT (MICROTONE) BEND: Strike the note and bend up 1/4 step. Francric: How should your fingers be so they don't touch the string above when pushing or coming down? Lyle: It's ok if your fingers push or pull into the other strings. Try to mute any unwanted noise with either hand. Lyle: BEND AND RELEASE: Strike the note and bend up as indicated, then release back to the original note. Only the first note is struck. Lyle: PRE-BEND: Bend the note as indicated, then strike it. Francric: What's the purpose of a pre bend? Lyle: It's an effect that is very unique to stringed instruments. You can do a pre-bend and then follow it with a release bend for a "sneaky sound" or a bluesy sound. Francric: So you wouldn't play it without a release? Lyle: You might play it several times in a row before you release it. Lots of blues riffs use all the bending techniques. Lyle: VIBRATO: The string is vibrated by rapidly bending and releasing the note with the fretting hand. Lyle: WIDE VIBRATO: The pitch is varied to a greater degree by vibrating with the fretting hand. Lyle: HAMMER-ON: Strike the first (lower) note with one finger, then sound the higher note (on the same string) with another finger by fretting it without picking. Lyle: PULL-OFF: Place both fingers on the notes to be sounded. Strike the first note and without picking, pull the finger off to sound the second (lower) note. Lyle: SHIFT SLIDE: Same as legato slide, except the second note is struck. Lyle: TRILL: Very rapidly alternate between the notes indicated by continuously hammering on and pulling off. Lyle: TAPPING: Hammer ("tap") the fret indicated with the pick-hand index or middle finger and pull off to the note fretted by the fret hand. Lyle: NATURAL HARMONIC: Strike the note while the fret-hand lightly touches the string directly over the fret indicated. Lyle: PINCH HARMONIC: The note is fretted normally and a harmonic is produced by adding the edge of the thumb or the tip of the index finger of the pick hand to the normal pick attack. Lyle: MUFFLED STRINGS: A percussive sound is produced by laying the fret hand across the string(s) without depressing, and striking them with the pick. Anessa: Are a lot of these better suited for an electric guitar? Lyle: Mostly the bending techniques, but any of these can be done and used on the acoustic guitar. 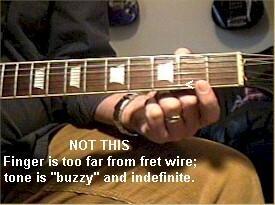 Lyle: PALM MUTING: The note is partially muted by the pick hand lightly touching the string(s) just before the bridge. Lyle: RAKE: Drag the pick across the strings indicated with a single motion. Lyle: That is the majority of the different tablature notations and techniques you'll end up using as you learn to play your guitar!